How many arms will your monster have? How many Legs? Let’s spin the wheel an d find out!!! Welcome to Build a Scare by Deanavryn Studios. iPad version. Create a unique ‘Scare’ (Monster) every time. Choose a background for your Monster. Choose a body. A spinning wheel numbered 1 to 6 is used in turn to choose the number of arms, legs, eyes, noses, mouths and ears to place on your Scare’s body. Build a Scare contains beautiful high resolution artwork designed specifically for the iPad’s retina display. This is matched perfectly with some unique background music and friendly narration to help your child build their Monsters. Children of all ages will have fun creating Monsters with Build a Scare. But wait. There’s more. The fun doesn’t stop there. Once you’ve finished building your Monster you can choose to magically turn it in to a Jigsaw puzzle. You can even choose to save your Monster to your Camera Roll to show your family and friends. 2 fun filled applications merged seamlessly in to 1 amazing app! Your child will have hours of fun with this one. Requirements for iPhone version: Compatible with iPhone, iPod touch and iPad. Requires iOS 4.3 or later. Requirements for iPad version: Compatible with iPad. Requires iOS 4.3 or later. When you first open the app you are at the home screen where you select ‘BUILD’ to begin. Once you select ‘BUILD’, you then have a choice of 10 different backgrounds of which you select 1, then you select a body with a choice of 10 again, then spin the wheel with number 1-6 to see how many arms you will will put on your scare, which can be put into any one of the highlighted positions, then you spin again for the legs. The next option is to spin the wheel for the number of eyes, nose, mouth and ears. Once your ‘Scare’ it built. You can either Save your Monster to your photos, Turn it into a puzzle or start again. If you would like to turn it into a puzzle, the app makes a 16 piece puzzles for your child to reassemble. The bright colours, the options and upbeat music make this a very cute fun app. I can see a child having lots of fun, playing this game over and over again. 1. When did you decide to develop this app? We had been thinking of developing children’s Apps for a while. Like everyone though finding the time to dedicate to these projects is difficult, especially with young children. Finally around July 2012 we decided to take the plunge and develop one of our App ideas to see how it would go. 2. When did you first release this app? 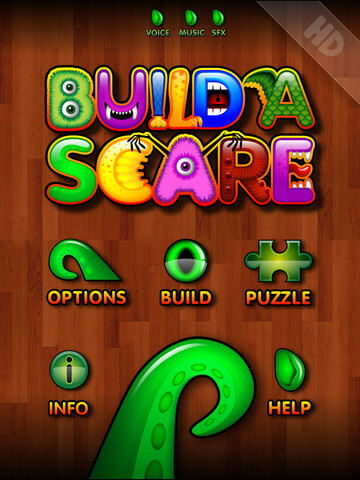 Build a Scare for iPad, iPhone and Android devices was released in October 2012. 3. How long did it take you to develop this app? Build a Scare took approximately 1 and a half months to actually develop and nearly 2 weeks for the App Store to approve. There were also many weeks of planning leading up to the actual development. 4. What is your favourite feature? Being able to make the Scare (Monster) you have created into a jigsaw. Our then 2 year old son loved doing jigsaw puzzles so we thought it would be a great idea to incorporate a jigsaw into the App. You are also able to create a jigsaw of any photo you have on your device. We liked this part of the App so much we released it as a separate App called ‘Jigsaw Creator’. 5. What is your favourite page in the app? The finished Scare (Monster) that is created and being able to save it or make it into a jigsaw. 6. What skills were you hoping to help the end user to develop? (eg fine motor, reasoning, education – maths, reading, social)? Build a Scare helps young users with counting as well as encouraging their creativity and imagination. By adding the jigsaw element this helps children with puzzle solving skills as well. 7. What age range would this app most suit? Boys and Girls from ages 2 – 7. Our 3 year old son loves Build a Scare and plays it for hours. 8. Are any new updates coming soon? At this stage there are a few ideas but nothing planned. We are open to and encourage suggestions though. We value any feedback. Our goal is to create Apps that our own kids would love to play. We also believe all children’s Apps/Games should be left ad free. So you will never find ads in any of our Apps.